Most responsible pet owners will ensure that their dogs are neutered. This helps to stop the chance of any unwanted puppies being born. Animal rescue centres and welfare organisations have many unwanted dogs to look after and rehome. Another litter of unwanted puppies compounds this situation and can potentially increase the burden on rescue centres and animal shelters. There are times, however, when families can be faced with an unplanned litter of puppies. There can be many reasons for this. Perhaps a female dog was unable to be spayed before she was rehomed or maybe a pregnant stray dog has been adopted by a family. Once it is apparent that a female dog is pregnant, one of the first things that should be arranged is a check up from a vet. A vet will be able to give the dog a thorough examination and give any special advice. A rescue dog may well have had previous illnesses or injuries and the vet will be able to determine whether this will have any effect on her pregnancy. Whelping box – a whelping box is specially designed to keep a mother and her puppies safe, while also ensuring that the mother dog cannot roll onto her puppies. This could result in the puppies becoming crushed or suffocated. The whelping box will be the young family's home for the first few weeks of their life. Whelping boxes are available from pet shops. Old towels and newspapers – the whelping box should be lined with clean newspaper and towels. A stock of both is useful and collecting these before the puppies are due will mean that they are to hand when the puppies are born. Food supplement and feeder – it is useful to have some puppy milk and a feeder in case one of the puppies is unable to feed properly. The mother dog should also be given a high protein diet and buying this in advance will save having to do this when the puppies are born. The mother will look after the puppies during their first few weeks of life. She will be responsible for keeping them fed, clean and safe. After a while the puppies will start to become inquisitive and will explore their surroundings. It is important that they are in a safe place and away from any sources of danger. When the puppies are weaned they can be rehomed. The challenge of rehoming puppies should never be underestimated. Any thoughts of keeping an entire litter should be avoided. Watching a new family of tiny pups playing together may appear endearing and cute, but these little creatures will soon grow up into large dogs. It is never too early to start to advertise puppies and getting good homes in place early on will reduce any stress later and will stop any puppies or young dogs having to go to rescue centres. 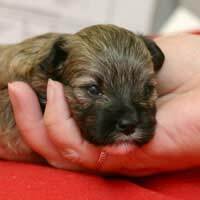 Puppies can be advertised in pet stores or at the local vets. Classified advertising in local papers can also be an option. While an unplanned litter of puppies can be a challenge, helping to look after the pups during their first few weeks of life and finding them loving and caring homes can be a rewarding experience.